Festo’s technical experts and efficient technologies ensure that machines and systems have shorter downtime, consume fewer resources and less energy. This leads to increases in the sustainability of production processes and overall company productivity. At Festo, energy efficiency is not just seen as a short-lived topic of discussion, but as a significant factor for sustainable competitive advantage. For many years, the company has been actively promoting all-round energy efficiency as is demonstrated by various research projects on this topic and the Scharnhausen Technology Plant. As a family enterprise with a long-term perspective, Festo has been living out energy efficiency for many years, both within the company and together with its customers. Energy efficiency is a competitive factor and must be established as a fundamental requirement of the production process. In keeping with this strategy, Festo focuses on the entire value chain in terms of energy efficiency – from engineering, via energy-efficient products, to the efficient design of systems and the energy-saving operation of machinery and equipment – in other words, ‘green’ production. This is also demonstrated by the ‘Experience Energy Efficiency’ exhibition at corporate headquarters in Esslingen-Berkheim (Germany), which makes the topic directly accessible through videos, interactive exhibits and exhibition modules, which demonstrate the company’s own products to customers and other interested parties. The focus is on a four-step approach that encompasses the interplay of intelligent systems design, energy-efficient products and solutions, sustainable services and sound vocational training. The engineering strategy demonstrates how production facilities can be designed with a view to energy efficiency. With an electromechanical spindle axis and a pneumatic linear drive, a design object at the first station of the exhibition provides insights into the technical complexity. The significance of total cost of ownership (TCO) is shown on the basis of acquisition and energy costs for three different handling systems over an operating period of several years with different cycle times. The visitor can set the desired payback period for a pneumatic, an electrical or a combined handling system, and ascertain which of these represents the most economical solution for the specific requirements. In the second part of the exhibition, Festo demonstrates how automation functions can be made energy-efficient using the company’s products and solutions. The centre of attention is a pencil-sharpening unit that informs the visitor by means of animated pictures of the twelve measures realised and the attainable economisation potential. Decentralised valve terminals located close to the drive units, for example, show how compressed air can be used in a more efficient manner using shorter tube lengths. In the third part of the exhibition, the visitor learns how existing pneumatic units and systems can be improved via the Festo Energy Saving Services. The model of a compressor block demonstrates the operation of a screw compressor. Pulsating LEDs simulate the compressed air, current and heat. 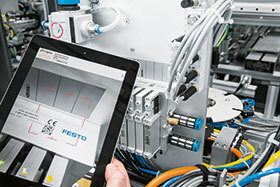 The fourth module from Festo Didactic is concerned with the connection between the acquisition of theoretical knowledge and its practical application. Here, visitors can see how control commands influence energy efficiency in an industrial unit. On completion of the tour, one thing becomes clear: energy efficiency issues can only be resolved by means of an all-encompassing strategy. Festo can provide this comprehensive overview, since it offers not only the hardware, but also consultancy, engineering, measuring services and training. Close cooperation with customers and suppliers is decisive for long-term success with regard to energy efficiency in automation technology. Festo is thus engaging in an exchange of experience with leading research institutes and other enterprises. Together with partners from nine European countries, Festo is active for example, in the EU research programme EMC2-Factory, which sets out to improve energy efficiency above all in energy-intensive production processes in the automotive, rail and aerospace industries. The company sets store by sustainable networks: in a pilot project, the company together with a customer at the Hettich group, a manufacturer of functional furniture fittings, succeeded in reducing the energy consumption of a production plant by 30 percent using optimised pneumatics. This concept is now being implemented step by step at the customer’s facilities. At its Scharnhausen Technology Plant Festo went even one step further when the facility earned an energy management system in accordance with DIN EN ISO 50001. This is a further example of how energy efficiency is being established as an issue of interdisciplinary significance throughout the enterprise. Another way that the organisation assists with maintenance and asset optimisation is by offering proper training through its Didactic division. One of the biggest challenges manufacturers face today are staff who are not properly skilled and cannot operate new machinery and technology efficiently. This can result in costly business disruption and productivity losses. With more and more South African manufacturing companies competing on a worldwide scale, it is imperative that they partner with trusted suppliers that have a global footprint and can assist them with their training requirements. Downtime is expensive. That is why it is important to identify and locate the causes of faults as quickly as possible and replace defective components without delay. Festo offers an online spares catalogue, which makes it easy to find replacement parts. However, Festo has taken convenience for replacement parts a step further by using its AutoID system. AutoID is all about having one channel for all information. Being able to retrieve data using the Product Key, Logistic Code and LabelDesigner makes life as a purchaser, maintenance engineer or production manager much easier. Clients can find the pointer to the digital twin of their components on the product or packaging. Festo calls this digital simplicity, and it saves time and supplies important information in a flash. The Product Key provides clients with precisely the information that describes their product. This helps them to locate documentation, customer order numbers, certificates, CAD data, circuit symbols, links to compatible device description files, commissioning software or to go straight to the product in the spare parts catalogue. The benefit is fast and unambiguous identification of the product. The Logistic Code has valuable logistical information for goods inwards processes – without having to be online. The benefit is faster and error-free receipt of goods. The LabelDesigner helps customers create bar code labels that can optimise their logistics and ordering processes. With their designation, the stored order quantity, product image, Festo part number and storage location, reordering becomes even faster and easier. It is easy for clients to use the Festo Online Shop (www.festo.co.za). In conclusion, Festo makes the repair process simple by posting practical and user-friendly video tutorials on topics that are the subject of frequently asked questions in the areas of maintenance, commissioning and repair. It could not be more simple than with Festo, engineers of productivity.